Richmond International Airport, VA (October 31, 2018) – Despite six days’ of schedule impacts due to Hurricane Florence, Richmond International Airport (RIC) reports a new monthly record as 321,484 passengers used the facility in September 2018, topping the previous mark set two years ago. This is the 12th consecutive monthly record at RIC. 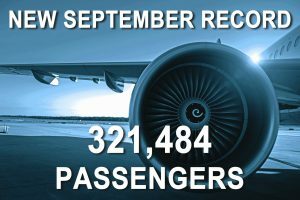 In September, RIC had a 7.6 percent year-over-year passenger traffic increase. Delta Air Lines was the month’s market share leader with 32.0 percent of passengers, followed by American (29.8%) and United (16.1%). Four incumbent airlines, United (+9.8%), Delta (+6.6%), Southwest (+4.9%), and JetBlue (+2.3%), reported year-over-year growth for September. Additionally, American reported solid numbers a year following a double-digit capacity boost in the market, Allegiant saw a 160% year-over-year passenger increase attributable to a robust September schedule and new nonstop service to Nashville, and new entrant Spirit Airlines made a significant contribution to the September passenger record. For the calendar year through September, RIC passenger traffic has increased 10.4 percent. Total cargo, measured as a sum of freight and mail, decreased 0.8 percent in September versus the year-ago period. For the calendar year to date, total cargo has increased 4.9 percent. Likewise, total operations decreased 2.7 percent, with air carrier (+10.6%) and air taxi (+7.1%) operations reporting increases over last year. For the calendar year, aircraft operations are up five percent. View the monthly aviation summary here. Through September, fiscal year-to-date (the Commission’s fiscal year runs from July through June) operating revenues totaled $13.1 million, greater than budget by $1.0 million (9%). For the same period, operating expenses amounted to $6.4 million, less than budget by $83 thousand (1%). The Capital Region Airport Commission authorized the President and CEO to execute a lease between Quantem Aviation and the Commission for the use of hangar and warehouse space through 2021, with an option for three one-year renewals. Richmond International Airport (RIC) is one of the most modern airports in the eastern United States. Seven major airlines, Allegiant, American, Delta, JetBlue, Southwest, Spirit, and United, offer nonstop flights to major domestic destinations and connecting options to points around the world. Annually, the Airport welcomes more than 3.8 million passengers. The activities of RIC and its tenants create nearly 16,000 jobs and $2.1 billion in economic activity for the Richmond region each year. To learn more, please visit flyrichmond.com.